This is the new control console for my toilet aboard Datawake, which has just had a major upgrade. Although most of my attention in the last year and a half has been on the übergeeky systems in the lab, there is much to be gained from improving tools that affect quality of life every day. Waterworks, sewage, power, heating/cooling, window treatments, galley, bed comfort, and the things in my recent Lifestyle Geekery post… all are unglamorous compared to holodecks and high-tech comm gear, but their effect on happiness is profound. Getting onto a more relaxed pump-out schedule here at the port helped a lot, but I was still living with cramped heads and vacuum leaks. Although the VacuFlush system is water-efficient and has a reputation for reliability, one of the long-range goals aboard is to be rid of all antiquated 32-volt systems… not to mention ancient sewage plumbing including a long one that looked like vacuum cleaner hose, wending its way to the deck pump-out fitting with a sticky brown residue on the outside. Ick. To the dumpsters, all of it! 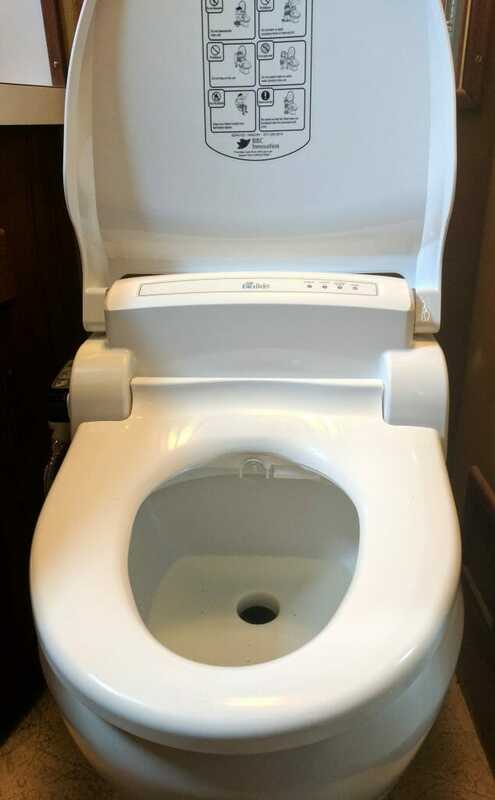 In the process of researching all this, I realized that it was an opportunity to integrate a bidet into my life; I’ve wanted one ever since encountering a Toto during my week at Google in 2015. But it didn’t take long to discover that marine toilets with integrated bidet seats are either ridiculously expensive (the Tecma E-Breeze is over $3K) or disappointingly primitive… and that mating a normal one with a standard marine toilet limits us to a narrow range of options. 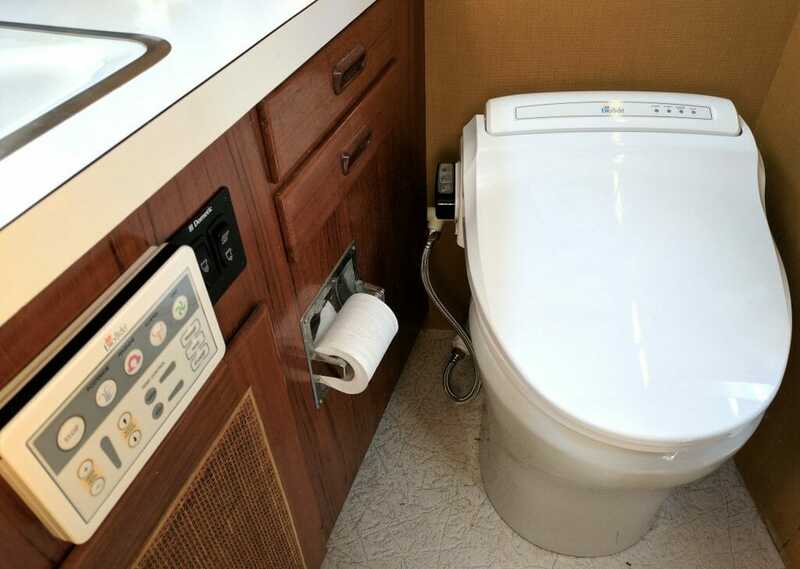 Not only do we have dimensions and seat bolt spacings that differ from domestic models, but most of the macerating electric units I was initially considering have a big step on the upper surface and bidet seats need room for equipment back there. I’m grateful to Sonja of Marine Sanitation and James of Bidet King for the long email thread as I attempted to figure all this out and get it right the first time. This was a different scale of plumbing project than I am used to; about the same time, my friend Steve re-did the heads on his sailboat, Grace… more like what I was used to before going to the Dark Side! With the mountain of parts on hand, it was time to dive in… and in this, I am lucky to have had the excellent assistance of my friend Nicolas, shown in this photo contemplating That Which Must Never Be Opened. 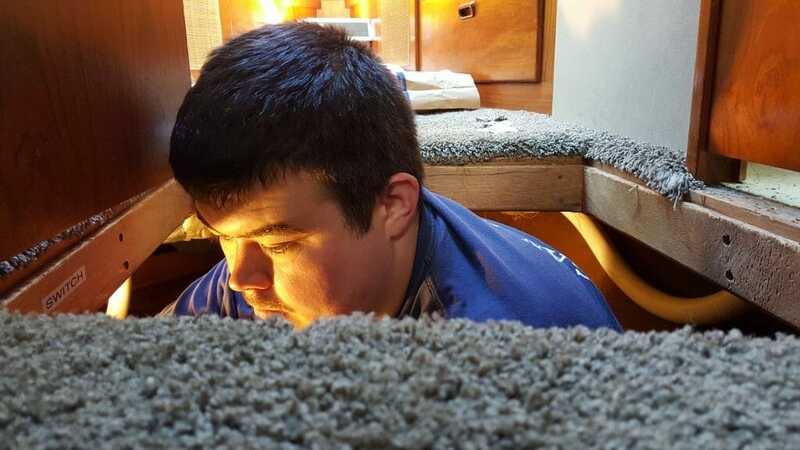 I’m anything but flexible these days, and this project involved many hours under the sole of the forward cabin, slithering into very awkward spots including the anchor locker (for the pump-out hose), and otherwise doing things that would have caused agony had I attempted them. Emptying the tank happens in two ways. Here in the port, when the Pumpty Dumpty boat comes around every few weeks (or when I fetch the portable DIY pump-out machine if I have had guests and miscalculated the burn rate), vacuum is applied to the deck fitting, pulling the tank contents through the hose via that all-important dip that allows complete emptying. 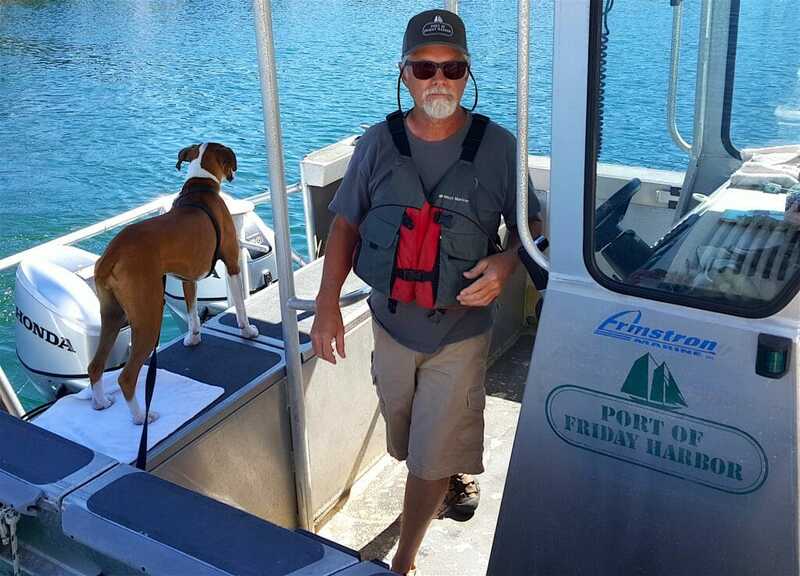 The other method, which becomes legal three or more miles offshore, uses the T12 macerator pump to slurp out the contents and send them through the same overboard discharge noted above. There is a huge human-error potential here; if I fail to open that stopcock and turn on the pump, the result will be the Worst Explosion Ever. On my to-do list is an interlock to prevent that tragedy from happening. The top of the tank has three additional fittings. A vent hose goes to a distant spot on the hull, high above waterline, preventing the tank from inflating or collapsing as it is being filled or emptied. An inspection plate can be opened if absolutely necessary, and the TLM100 ultrasonic sensor reports the tank level via the NMEA2000 network (accessible via browser using the iKommunicate gateway). This replaces a Wema float sensor and analog gauge that I never could get working properly. 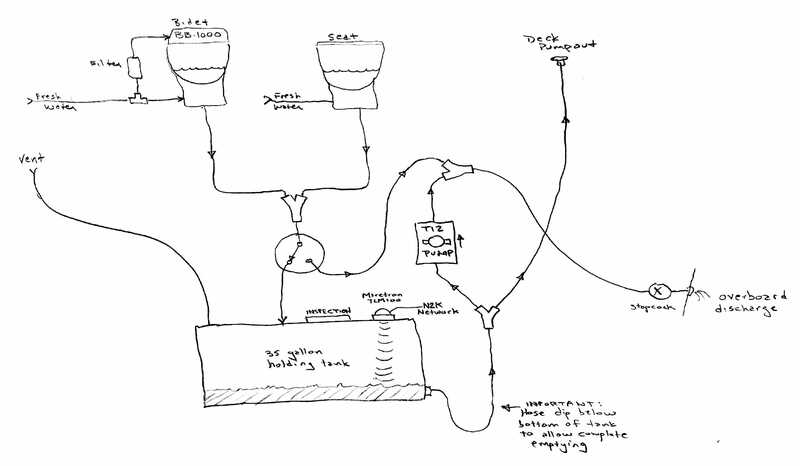 This allows fine-grained control over water usage, which I consider essential when the limited space of a holding tank is a factor. Even though I am fond of blinkies, I am happy with the all-manual control version of the toilet (without the .85-gallon default, which their awful late-night-TV-style marketing video describes as “extreme low flush technology.”) I like being able to choose how much water gets used, and tend to be stingy with it. Besides, these were considerably cheaper than the automatic models. Operators are standing by! One of my initial worries was that even with an efficient toilet the bidet would use enough water to blast through the 35-gallon holding-tank budget, but I’ve been delighted to observe that this is not a problem. But the best part is… well… the bidet. I love it! If you’ve never tried one, you have no idea… this is one of those things that changes the baseline comfort level of your life (I know, that sounds like marketing hyperbole, but please trust me on this… without having to go into detail). Also, it’s the little things… as you can see in the thermal image from my FLIR ONE camera at the top of this post, it has a heated seat (adjustable), and that is a delight. As you can see in the photos above, I don’t have a lot of space. This is the master cabin head compartment, and the one for the forward cabin is even skinnier. 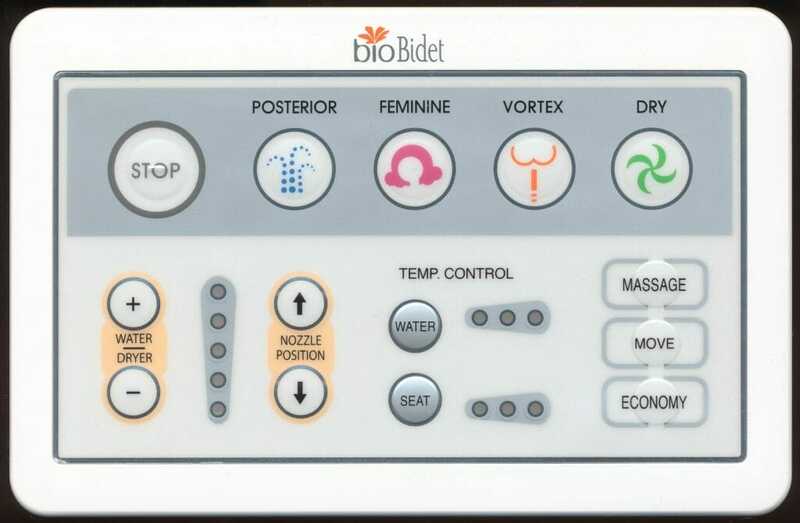 Having never owned a bidet seat before, I had nothing to go on (so to speak) except marketing literature and reviews; the model I chose rose to the top of the list because of the remote control panel. For a while I was planning to get the less-expensive and better-reviewed BB-600E, but the width of the side-mounted control panel would have made for a tighter squeeze (especially in the forward cabin). Here it is doing a quick warm-water “posterior wash” with auto-move enabled, followed by a short dry-air cycle. It is not as scary as it looks. 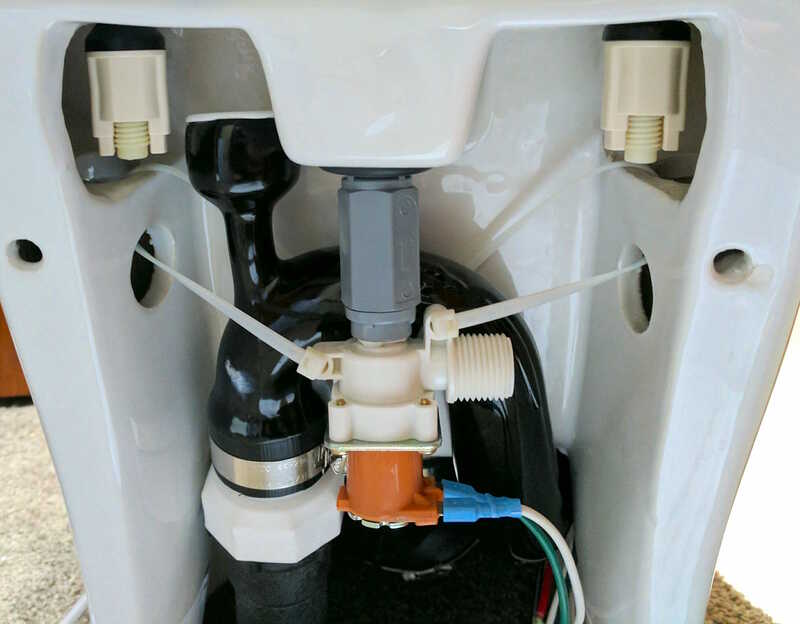 The system has now been in use for a couple of weeks, and I’m mostly pleased, although the flat bottom of the Masterflush bowl translates into more frequent cleaning. 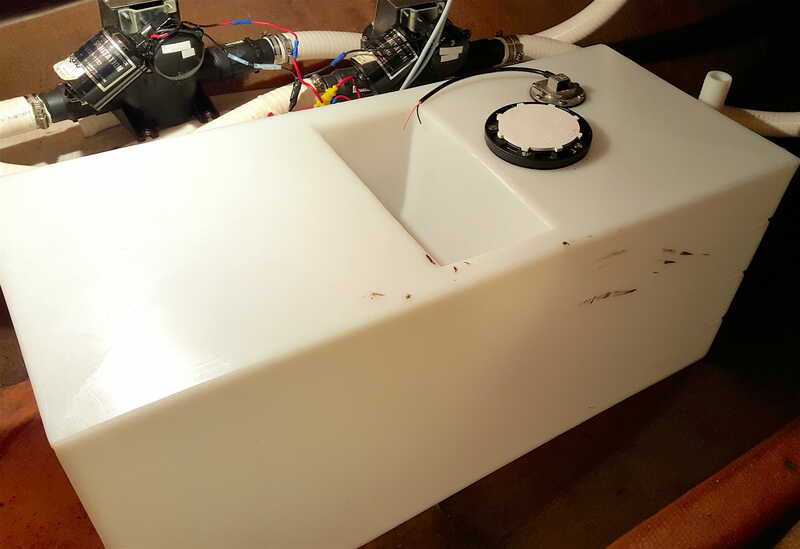 Four minor tasks remain… properly lashing the tank to its mounting platform so it stays put in rough seas, tidying up cabling, doing a proper drawing for the documentation library, and installing the Maretron TLM100 ultrasonic level sensor. 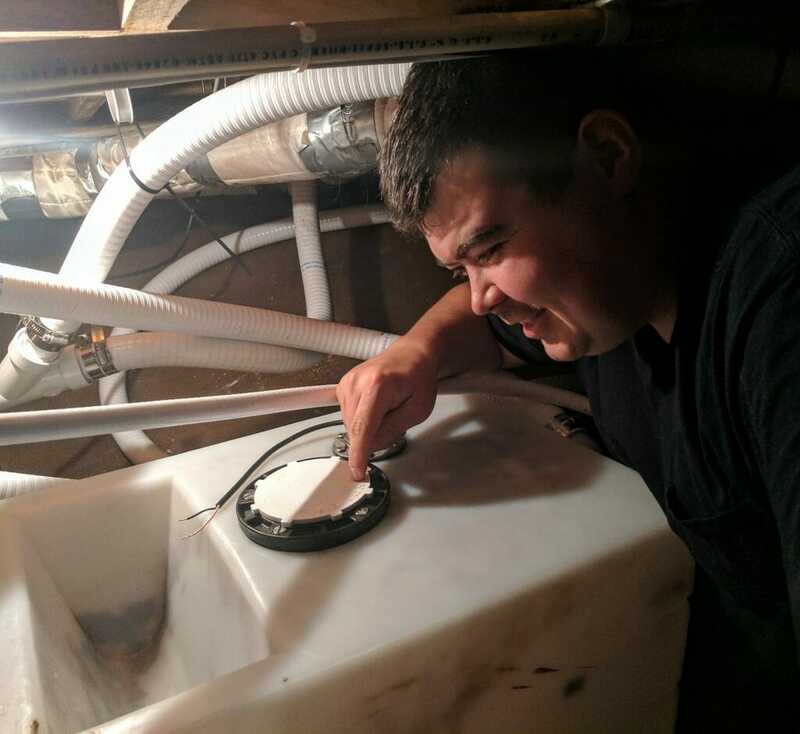 It’s so uncivilized to pop open the floor hatch, get down on hands and knees, turn on the light, and actually look at the tank to see if we are nearing pump-out deadline. On Nomadness, I had a stand-alone monitor with three capacitive sensors on the side of the tank; here on Datawake, I use a low-light video camera with infrared illuminator to throw an image of the ancient fresh-water tank sight glass onto the ship video network. With every new system, I try to get closer to the Platonic ideal of accurate data collection and high reliability.